Actinobacillus is a genus of gram-negative, immotile and nonspore-forming, oval to rod-shaped bacteria occurring as parasites or pathogens in mammals, birds, and reptiles. It is a member of the Pasteurellaceae family. The bacteria are facultatively aerobic or anaerobic, capable of fermenting carbohydrates (without production of gas) and of reducing nitrates. The genomic DNA contains between 40 and 47 mol % guanine plus cytosine. 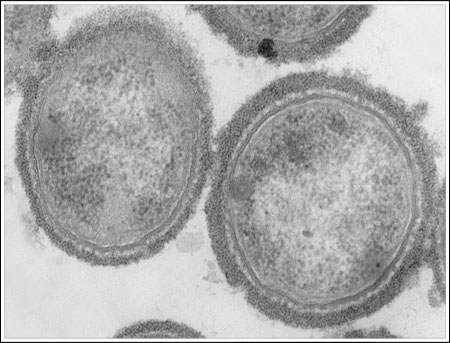 Actinobacillus (Pasteurella) ureae and A. hominis occur in the respiratory tract of healthy humans and may be involved in the pathogenesis of sinusitis, bronchopneumonia, and meningitis. Actinobacillus actinomycetemcomitans occurs in the human oral microflora, and together with anaerobic or capnophilic organisms (HACEK group organisms) may cause endocarditis. Actinobacilli are susceptible to most antibiotics of the beta-lactam family, aminoglycosides, tetracyclines, chloramphenicol, and many other antibacterial chemotherapeutics. An analysis of Actinobacillus actinomycetemcomitans indicated that it was monophyletic with Haemophilus aphrophilus and Haemophilus segnis, and it was proposed that they be reclassified as a new genus, Aggregatibacter (from the Latin, "aggregare", meaning "to come together"). ^ Chung et al. (2008). "Actinobacillus pleuropneumoniae". Pasteurellaceae: Biology, Genomics and Molecular Aspects. Caister Academic Press. ISBN 978-1-904455-34-9. ^ Kuhnert P; Christensen H (editors). (2008). Pasteurellaceae: Biology, Genomics and Molecular Aspects. Caister Academic Press. ISBN 978-1-904455-34-9. ^ Rogers A H (editor). (2008). Molecular Oral Microbiology. Caister Academic Press. ISBN 978-1-904455-24-0. ^ Nørskov-Lauritsen N, Kilian M (September 2006). "Reclassification of Actinobacillus actinomycetemcomitans, Haemophilus aphrophilus, Haemophilus paraphrophilus and Haemophilus segnis as Aggregatibacter actinomycetemcomitans gen. nov., comb. nov., Aggregatibacter aphrophilus comb. nov. and Aggregatibacter segnis comb. nov., and emended description of Aggregatibacter aphrophilus to include V factor-dependent and V factor-independent isolates". Int. J. Syst. Evol. Microbiol. 56 (Pt 9): 2135–46. doi:10.1099/ijs.0.64207-0. PMID 16957111. The antibacterial mechanism of berberine against Actinobacillus pleuropneumoniae. Kang S1, Li Z1, Yin Z1, Jia R1,2, Song X1, Li L1, Chen Z1, Peng L1, Qu J1, Hu Z1, Lai X1, Wang G1, Liang X1, He C1, Yin L1. Natural product research.Nat Prod Res.2015 Dec;29(23):2203-6. doi: 10.1080/14786419.2014.1001388. Epub 2015 Jan 23. Effects of heterologous expression of phosphoenolpyruvate carboxykinase and phosphoenolpyruvate carboxylase on organic acid production in Aspergillus carbonarius. Yang L1, Lübeck M2, Lübeck PS3. Journal of industrial microbiology & biotechnology.J Ind Microbiol Biotechnol.2015 Nov;42(11):1533-45. doi: 10.1007/s10295-015-1688-4. Epub 2015 Sep 24. Sequence and structural diversity of transferrin receptors in Gram-negative porcine pathogens. Curran DM1, Adamiak PJ2, Fegan JE3, Qian C4, Yu RH5, Schryvers AB6. Vaccine.Vaccine.2015 Oct 13;33(42):5700-7. doi: 10.1016/j.vaccine.2015.07.097. Epub 2015 Aug 8.